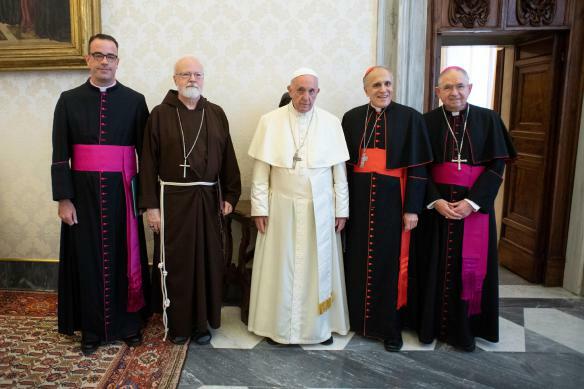 Catholic News World : #BreakingNews US Bishops Conference FULL TEXT Statement on Meeting with Pope Francis "...together for God's mercy and strength as we work to heal the wounds." #BreakingNews US Bishops Conference FULL TEXT Statement on Meeting with Pope Francis "...together for God's mercy and strength as we work to heal the wounds." Following a private audience with Pope Francis this morning in Vatican City, Cardinal Daniel DiNardo of Galveston-Houston and President of the United States Conference of Catholic Bishops has issued the following statement regarding the recent moral crisis in the American Catholic Church. "We are grateful to the Holy Father for receiving us in audience. We shared with Pope Francis our situation in the United States -- how the Body of Christ is lacerated by the evil of sexual abuse. He listened very deeply from the heart. It was a lengthy, fruitful, and good exchange. As we departed the audience, we prayed the Angelus together for God's mercy and strength as we work to heal the wounds. We look forward to actively continuing our discernment together identifying the most effective next steps."